Let's get started and Activate your account! By clicking "Go To Step 2" I request and grant my consent to be contacted by a member of the 24/7 Call-A-Doc Care Coordinating Team by telephone or email regarding the 24/7 Call-A-Doc services. Submitting personal information above constitutes my electronic signature. Summary Notice of HIPAA Privacy Practices THIS NOTICE DESCRIBES HOW MEDICAL INFORMATION ABOUT YOU MAY BE USED AND DISCLOSED AND HOW YOU CAN GET ACCESS TO THIS INFORMATION. PLEASE REVIEW IT CAREFULLY AND REPORT ANY GRIEVANCE TO: 24/7 Call-A-Doc PRIVACY OFFICER, 8670 Wilshire Blvd. Suite 301, Beverly Hills, CA 90211; PHONE. (844) 362-2447. The Health Insurance Portability & Accountability Act of 1996 (HIPAA) is a federal program that requires that all medical records and other individually identifiable health information used or disclosed by us in any form, whether electronically, on paper, or orally, are kept properly confidential. This Act gives you, the Patient, significant new rights to understand and control how your health information is used. HIPAA provides penalties for covered entities that misuse personal health information. We have prepared this "Summary Notice of HIPAA Privacy Practices" to explain how we are required to maintain the privacy of your health information and how we may use and disclose your health information. A Notice of HIPAA Privacy Practices containing a more complete description of the uses and disclosures of your health information is available to you upon request. We may use and disclose your medical records for each of the following purposes: treatment, payment, and health care operations: TREATMENT means providing, coordinating, or managing health care and related services by one or more health care providers PAYMENT means such activities as obtaining payment or reimbursement for services, billing or collection activities and utilization review. HEALTH CARE OPERATIONS include managing your Electronic Medical Record to facilitate diagnostic medical consultations with participating physicians, as well as conducting quality assessment and improvement activities, auditing functions, cost-management analysis and customer service. We may also create and distribute de-identified health information by removing all references to individually identifiable information. We may contact you to provide information about our services or other health-related services that may be of interest to you. Any other uses and disclosures will be made only with your written authorization. You may revoke such authorization in writing and we are required to honor and abide by that written request, except to the extent that we have already taken actions relying on your authorization. You have the following rights with respect to your protected health information, which you can exercise by presenting a written request to the 247CallADoc Privacy Officer: 1. You have the right to ask for restrictions on the ways we use and disclose your health information for treatment, payment and healthcare operations. You may also request that we limit our disclosures to persons assisting your care. We will consider your request, but are not required to accept it. 2. You have the right to request that you receive communications containing your protected health information from us by alternative means or at alternative locations. For example, you may ask that we only contact you at home or by mail. 3. Except under certain circumstances, you have the right to inspect and copy medical, billing and other records used to make decisions about you. If you ask for copies of this information, we may charge you a nominal fee for copying and mailing. 4. If you believe that information in your records is incorrect or incomplete, you have the right to ask us to correct the existing information or add missing information. Under certain circumstances, we may deny your request, such as when the information is accurate and complete. 5. You have a right to receive a list of certain instances when we have used or disclosed your medical information. If you ask for this information from us more than once every twelve months, we may charge you a fee. By clicking "Confirm" I agree and consent to the above terms and conditions and HIPPA statement and this constitutes my electronic signature. This message is to confirm your 24/7 Call-A-Doc account activation. Please print for your records. As a member of 24/7 Call-A-Doc, you and your family will have round-the-clock access to U.S.-based licensed physicians for telephone, video* and e-mail medical consultations. Doctors can be difficult to contact, illnesses can occur in the middle of the night or at work; sometimes you have a question that doesn't require an in-person consultation. 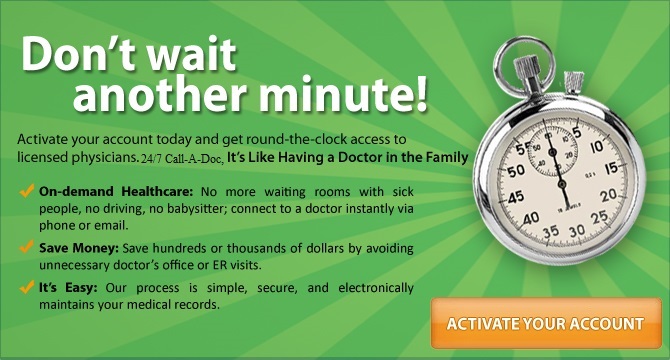 24/7 Call-A-Doc offers a convenient solution to those instances and more! 1. Diagnostic Consultations: When you need more than basic medical advice and require a thorough examination, including prescription medication when necessary, diagnostic consultations are available. 2. eConsultations: When you need some basic informational consultation, our informational eConsultations are available. 3. Electronic Medical Records: A personal health profile that stores your medical history, consultations, doctor's notes and follow up discussions. The information submitted is secure and confidential, and is available at any time. This record can also be shared with your primary care physician for continued care. You have a question or need a refill of your regular (diabetes, blood pressure, etc) medication. Please call 844-362-2447 to speak to one of our friendly Care Coordinators to get your 24/7 Call-A-Doc login information. They will gladly walk you through the online set up of your 24/7 Call-A-Doc membership account. Once your account is set up and your health questionnaire is complete you will be able to speak with a physician within minutes or log on to http://www.247CallADoc.com/member and access your personal health portal. I was traveling out of state and realized i left my high blood pressure medication. I called an 24/7 Call-A-Doc physician and he called in a prescription for me by the hotel. Andy G.
Copyright © 2019 24/7 Call-A-Doc. All rights reserved.